LASIK, which stands for laser-assisted in situ keratomileusis, is a type of laser assisted refractive eye surgery that is used in the treatment and correction of myopia, hyperopia and astigmatism. In the procedure, an ophthalmologist uses a laser to reshape the eye’s cornea to help improve vision. LASIK eye surgery generally provides a permanent alternative to glasses or contact lenses. What we now know as LASIK treatment originally stemmed from the mind of Spanish ophthalmologist Jose Barraquer, in Bogota, Columbia, in the 1950’s. Fast forward several decades later, to 1980, where Rangaswamy Srinivasan, working in an IBM research laboratory, discovered the use of ultraviolet excimer lasers in etching human tissue with no thermal damage to the surrounding area in question; a phenomenon he coined as “ablative photo-decomposition”. Five years later, Steven Trokel, from the Edward S. Harkness Eye Institute, Columbia University in New York, published his work using the excimer laser. Leap a few more years, and in 1989, the first refractive laser eye surgery was conducted on a human. It was this same decade that saw Dr. John Goosey enter the world of visual improvement. As early as 1984, Dr. Goosey was well versed in the area of keratoconus and corneal procedures, contributing his research to various journals and curriculums. In the early to mid-90’s, he began to perfect his craft in the art of laser assisted eye surgery, becoming one of the leading and foremost experts in the world. Since then, LASIK eye surgery has become the leading option in corrective vision treatments, and there aren’t really any better hands you could be in. Today, Dr. Goosey has performed thousands of highly successful laser correction surgeries with the WaveLight® Allegretto Wave® Eye-Q Laser, and is an eye surgeon who is considered an expert even by other surgeons. Dr. Goosey is one of the few ophthalmologists in the United States, let alone Houston, that uses the latest technology for LASIK eye surgery: The WaveLight® Allegretto Wave® Eye-Q Laser system. It was the first new laser approved by the FDA, and in 2003, it was granted the widest approval range ever initially given to a new laser for both myopic and hyperopic vision correction. During the procedure, Dr. Goosey uses this innovative computerized laser technology, and his surgical skill, to create a thin flap on the outer layer of the cornea. These precise lasers are designed to effectively reshape the curvature of your cornea. This, in turn, results in correcting the refractive error in each eye and ultimately improving your field of vision without continued use of glasses or contacts. The beauty of LASIK eye surgery is that there is no bleeding or stitches, your eyes heal naturally, and surprisingly with little downtime. Dr. Goosey requires that patients NOT WEAR contact lenses for 3-7 days prior to the surgery depending on your contact lens type, as wearing contacts can affect the shape of the eye. Patients are given a set of instructions to follow once LASIK eye surgery is scheduled; as well as, instructions for aftercare and the recovery period. Technology is super important when it comes to vision correction. 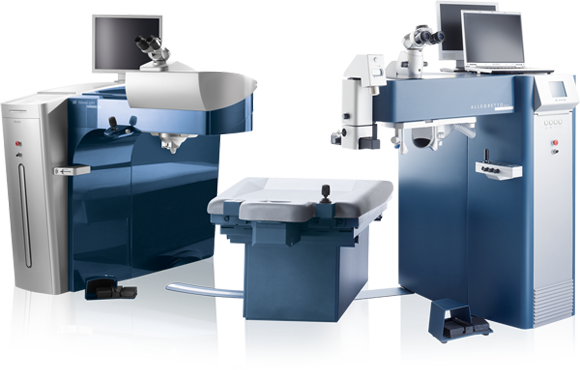 There are many lasers available for LASIK vision correction, but only one is one the most preferred laser system available. With this laser system, Dr. Goosey has performed thousands of successful LASIK vision correction surgeries. If you’ve read this overview in its entirety, that means you are seriously considering LASIK eye surgery as an option! Why not take the first step today? If you prefer to make an appointment by phone, or have more questions, give us a call at 281-407-9062. We’ll be happy to assist you!